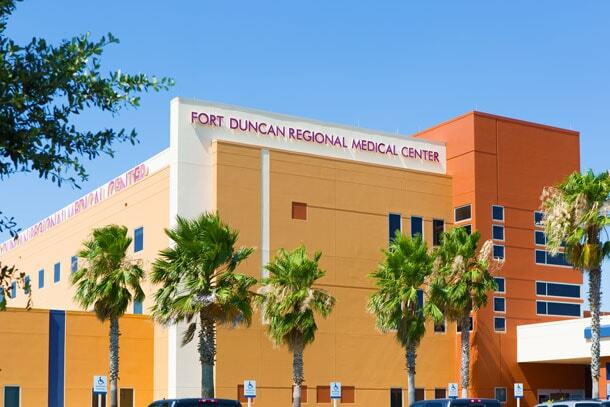 Fort Duncan Regional Medical Center is a progressive acute care facility and medical center that serves Eagle Pass, Texas and surrounding regions. Fort Duncan Regional Medical Center is always working to enhance the services it provides to patients. The hospital is actively recruiting doctors, including cardiologists, obstetricians/gynecologists and primary care physicians. Through these efforts, we are working to provide better healthcare, meet increased demand for healthcare services and improve the quality of life for residents of our community. Learn more about the comprehensive care available at Fort Duncan Regional Medical Center. We’re building on a long tradition of quality medical care in a comfortable and convenient environment for the peace of mind of thousands of patients who are cared for by doctors and nurses at Fort Duncan Regional Medical Center. Fort Duncan Regional Medical Center is owned and operated by a subsidiary of Universal Health Services, Inc., of King of Prussia, Pennsylvania, one of the nation's largest hospital management companies. The hospital is accredited by The Joint Commission and licensed by the state Regulatory Affairs Department. Central to the hospital's mission is its commitment to excellence in serving patients—from providing an aesthetically pleasing environment, to ensuring quality in medical care. Every employee receives service excellence training and personally pledges to put our patients' needs first. You'll notice when you enter our front door, that we take pride in providing a safe and secure environment for our patients. Patients are entitled to privacy during their stay at the hospital and continued confidentiality about all medical information. Fort Duncan Regional Medical Center will provide timely, professional, effective and efficient service to all of our customer groups. We will identify the key needs of our customers, assess how well we meet those needs, continuously improve our services, and measure our progress. We understand that the professionalism and drive of our people are the most important factors in the quality of the service FDRMC provides. We will hire talented people, increase their skills through training and experience, and provide opportunities for personal and professional growth within the company. We are committed to forming relationships of fairness and trust with our patients, purchasers of our services, and our employees. We will conduct our business according to the highest ethical standards. We will work together to provide ever-improving customer service. This team approach to our work will supersede traditional departmental organization and create a true customer focus. People at all levels of the organization will participate in decision-making and process improvement. We will never lose sight of the fact that we provide care and comfort to people in need. The patients and families that rely upon us are fellow human beings and they will receive respectful and dignified treatment from all of our people at all times. We will invest in the development of new and better ways of delivering our services.